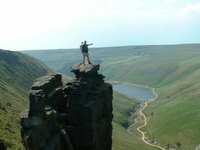 Walking across the hills of Saddleworth yesterday, climbing Noon Sun Hill from the valley bottom at Royal George, striding over through the heather, grouse and meadow pipit flying up before me, I met several fellow walkers, also enjoying the brilliant sunshine. I followed signposts – a yellow acorn and an arrow pointing my way up the hill. I was traversing part of the recently opened Pennine Bridleway, which runs up from near Matlock in Derbyshire, though the White Peak to meet the Dark Peak, flanking Kinder Scout and wending its way, by canal towpaths and old railway lines to Saddleworth before it heads north. Turning back occasionally to enjoy the view of Saddleworth – more or less all of it from this height, I saw that I had reached a point just slightly higher than the other hills in Saddleworth. I could see right over Wharmton to the village of Scouthead, with High Moor at its back. I could see the sharp perpendicularity of Besom Hill brickworks above Moorside. I could see beyond, across the hills that encircle the town of Rochdale, sliced at Milnrow by the roaring, rushing M62. Looking the other way from Alphin Pike, I was startled by how close Buckton Castle was to this, most prominent hill in my own area. Below the Roman fort, the hill was eaten away by the workings of Buckton Quarry, now no longer worked for its sandstone. Walking along the edge now towards Chew Brook and its reservoir, the grey, flat slabs of the top of Wimberry Stones, known locally as ‘Indian’s Head’ appeared. 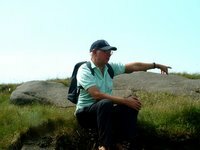 Picking my way across bare peat, thankfully dried out a little after the few days without rain, and stepping on grey millstone grit and the sand left by its erosion, I quickly and easily reached the slabs and rested. These grey, flat lying stones belie the sheer drops from their greening cornices and buttresses. A prized area for any climbers bold enough and skilled enough to dare attempt to scale these rock faces, Indian’s Head draws the eye from down below in a way that eludes anyone passing by the top of them. The path on towards Chew Brook now takes a rocky turn or two before running round the edge of the precipice towards the dam bank of Chew Reservoir. It was just here that I met my first hill walkers; a couple from Alfreton in Derbyshire, out of Crowdon Youth Hostel for a hard day on the moors before motoring back to their north midland town, off the beaten track of Matlock Bath and beyond. This walk, my new friends informed me, was to get ready for the rigours of the Coast to Coast walk which they would shortly be attempting. You do need to be fit to walk day after day for up to a week or more, and the limiting factor in one’s fitness is not the capacity of the lungs or the strength or otherwise of calf muscles, but the soles of your feet. The constant pounding they take in any day’s walk on the hills is enough to make them sore. But, like having to get used to the discomfort caused by the saddle of a pushbike, feet have to go through pain to be able to overcome it. Strong leather boots with thick woolen socks are a must on terrain like this – a twisted ankle could prove disastrous in such an isolated, precarious place. It is the boots as well as the pounding that have to be endured, and only continual tramping over heather and through peat bog will do the trick. Slowly but surely, the soles of the feet harden, the soreness abates and all is well. To my own cost, I found that my own feet, being unused to such treatment as a good walk over the tops, felt more and more sore as the day wore on. Doubtless the energetic looking couple I had spoken to had feet with soles like the undersides of frying pans, and would have no trouble setting out from St. Bees Head, pointing greyly into the Irish Sea and beckoning across the dark waters to Snaefell on the Isle of Man. 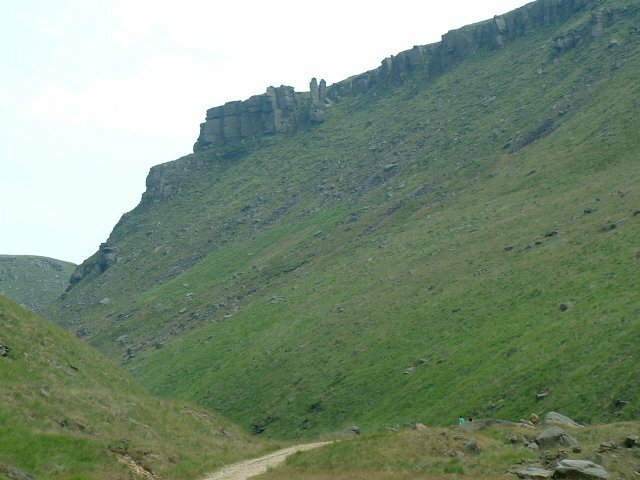 Doubtless they would still be in good order as they reached Ravenscar frowning imperiously over its neighbouring Robin Hood’s Bay on the windy coast of Yorkshire. I wished them well and carried on to the immaculate stonework of the culverts and overflows of the reservoir. White water, the name for turbulence in rivers and on oceans, roared below as Chew Brook fairly flew down to hill to be finally subdued by Dovestones Reservoir far below. Several people were sunning themselves on the dried grass bank, and passing them by quietly, I climbed quickly to get my first glimpse of the brown waters of Chew Reservoir for perhaps more than 20 years or more. This most remote of the area’s reservoirs has as its catchment area only the ground that is higher – stretching to the edge of Crowdon Great Brook, and Laddow Rocks on one side, and Featherbed Moss on the other, a great expanse of featureless moorland leading back to Tintwhistle and the many, long reservoirs of Longdendale. Standing brim full of water stained by the peat of the surrounding drainage, it is difficult to guess at the depth of the water. It might, for all anybody can tell, be hundreds of feet deep, or it might be less than six; it is impossible to tell by looking into its opaque depths. Actually, in less pluvial times, when the little streams that drain the moor dry up and the water level falls, it is surprising to see that the whole of the bed of this reservoir is taken up by banks of peat; that it is filled by the material the streams flow through and erode continually. It is obvious in drier times, less so in wet ones, that this reservoir would benefit from being dredged of its banks of eroded sandstone and peat; that it would hold much more water than it can possibly hold in its present state, and that if it did, water would not be in such short supply as it is when town councils announce hosepipe bans to the consternation of gardeners and people washing their cars everywhere. Still, the reservoirs look full, which serves to increase the complacency of companies paid to fill our baths and washbasins, to flush our toilets and water our flower beds. Stretching out again, diagonally, on a compass bearing, the brown waters at my back, I soon find the paths that skirt the tops of the edges of these high hills. Gritstone outcrops punctuate the skyline, and at intervals on the higher ones is heard the encouraging shouts of climbers, safely belayed, bringing up their pals below. And then a slow and painful descent down to the dam wall of Yeoman Hey Reservoir – just the thing to make my knees just that little bit more painful than they already are. And strangely enough – well not at all strange when you think about it – the relative coldness and indifference of the hoards of motorists sunning themselves stretching back and almost touching their car radiators, still hot from the journey out from the town that is uncomfortably hot on this lovely warm Sunday at the beginning of July. Hi Rob, this is Les, one of the walkers you met! Just thought I ought to tell you, Sue is doing the C2C on her own. I go and see her off tomorrow morning, and she'll be back in my arms on 19th of July. It was great to meet you, and I hope to start a blog soon, and maybe with your help (as I LOVE the way you do yours), I will build a good one. It will feature pictures a lot, for obvious reasons. Thanks for the chat.